Detailed data analysis of PedSafe countermeasures is presented in the separate January 2008 Data Analysis Report. The report was authored primarily by the UC Berkeley Traffic Safety Center (TSC), with support and review by the SFMTA. While that report is summarized in the Executive Summary, readers interested in the safety effectiveness of the PedSafe countermeasures should refer to the full Data Analysis Report. This is incorporated by reference. The Data Analysis Report focused primarily on the impacts of the countermeasures on pedestrian and driver behavior and pedestrian attitudes. The report did not include the following material regarding the performance of pedestrian detectors used at several PedSafe study locations. Automated detection of pedestrians was used in San Francisco prior to the PedSafe project to activate in-pavement crosswalk lights. Both overhead microwave detection units and infrared bollards have been used, and as described in Section 4.3-3, the infrared detection has proven more effective. Automated detection of pedestrians was installed at two locations specifically for the PedSafe project. For the Mission and Santa Rosa location automated pedestrian detection using infrared bollards and in-pavement surface automated detection (ISAD) was tested. When adjusted correctly, the detector performance was similar to that reported for the in-pavement lights in Section 4.3-3. 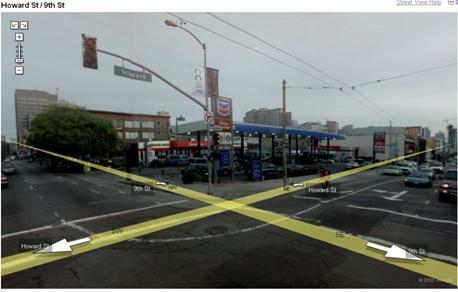 For the intersection of 9th and Howard Streets video detection for the purpose of increasing pedestrian crossing time was tested, using a camera initially installed at this intersection by the city’s new Integrated Transportation Management System, SFgo. Since this is a new detector technology, an evaluation of its performance is included. Howard and 9th Streets are major, five-lane arterials; Howard Street is one-way westbound and 9th Street is one-way northbound. The video detection camera focused on a single Howard Street crosswalk. Detection zones were set up similar to virtual “detector loops” in three zones. As shown in Figures 4.2-1 and 4.2-2, the detector loops appear as bars within the northeast crosswalk. When a late-crossing pedestrian is detected, the “Ped Call” indicator appears at the top of the screen (see Figure 4.2-3). Equations were developed to predict whether a pedestrian in a zone at a specific time late in the Flashing Red Hand phase would likely still be crossing when cross traffic was released. A compensating extension of up to 3 seconds was triggered, depending on how late the pedestrian appeared to be. This resulted in an extension of the green ball and solid Red Hand phase (as if the traffic green were extended at the very end of its phase, but in this case to encourage pedestrians to finish crossing quickly). It was intended that the logic would minimize extensions due to vehicles encroaching on the crosswalk. The manufacturer, Econolite, has offered to work on this problem, but this has not yet taken place. View courtesy of Google, Inc.
To assess the detector performance at 9th and Howard Streets, we focused on the following primary outcome variables: (1) the percentage of pedestrian who complete crossing during the Red Hand phase or during the red traffic signal, (2) the number of vehicle/pedestrian conflicts, (3) the percentage of missed activations, and (4) the percentage of false activations. After installation, pedestrian data and observations were manually collected at 9th and Howard Streets for a 30-minute period during the noon hour on Tuesday, March 6, 2007. We conducted before and after observations for the primary variables in addition to the following information: number of pedestrians crossing, whether there was a 3-second extension, the reason for the extension (late pedestrian, autos encroaching in crosswalk, or other reason). We also noted whether the pedestrian was running, aborted the crossing, and any vehicle/pedestrian conflicts as well as the location (lane #) of the pedestrian at the end of the Flashing Red Hand (FRH) phase. Additionally, Econolite Autoscope Detector software is able to generate a log of the signal activations. This can be reviewed to determine how many and how long the actual extensions were. During a 30-minute manual count, the automated pedestrian detection system consistently detected late-crossing pedestrians who activated the 3-second extension. Most late-crossing pedestrians triggered the extension while in the second lane from the curb from either side of Howard Street. A total of 70 pedestrians were counted crossing the eastside crosswalk at Howard Street. Of the total number of pedestrians crossing, 8 (11%) of the counted pedestrians activated the pedestrian crossing phase extension by crossing late. Four (6%) of those 8 pedestrians were in a group. There were 5 false extension activations due to vehicles encroaching into the crosswalk to make a right turn on a red onto 9th Street northbound from the curb lane. All of the observed late-crossing pedestrians were detected by the camera which triggered the extension. The vehicle encroachment into the crosswalk triggering the pedestrian extension did not impact the traffic flow and no vehicle/pedestrian conflicts were observed. In addition, no pedestrians were observed running or aborting their crossings. The manual results are consistent with findings by Econolite that during a typical 3-hour afternoon period, there was an extension over 1 second in length for 14% of the cycles. (See Figure 4.2-4.) The signal timing was set so that an extension was followed by a compensating reduction in the Walk phase of the next cycle to maintain the average 60-second cycle. In the figure, the bars exceeding 60 seconds indicate triggering of the timing extension, while bars shorter than 60 seconds indicate the compensating reduction in time during the following cycle. The figure suggests that the extension logic was successfully implemented. The following presents analyses performed for countermeasures that were not installed with FHWA funding. These analyses were conducted outside of the PedSafe Evaluation Plan, and often used different measures of effectiveness, data collection techniques, and schedules. As described above, the SFMTA was unable to implement a pedestrian scramble (exclusive pedestrian phase) during the PedSafe deployment phase. However, extensive data collection and analysis was conducted on four adjacent Stockton Street scramble intersections, with similar traffic and pedestrian characteristics, during the Planning Phase I, under a totally separate project. These four intersections (at Pacific Avenue, Jackson, Washington, and Clay Streets ) have somewhat higher pedestrian volumes and slightly lower cross street traffic volumes than the intersection at Sacramento Street. It was also possible to do pedestrian collision analysis for these four intersections and several others. The raw number of pedestrian injury crashes before and after installation at the four existing Stockton Street study intersections increased (comparing equal 2.5-year periods) from 2 to 4. (See Figure 4.3-1.) However, there were factors suggesting that this result should not imply that the pedestrian scramble phasing itself was causing more pedestrian injuries. First, the pre-installation crash level was relatively low compared to the high pedestrian volumes, suggesting that an increase could represent regression to the mean. Second, two of four post-installation crashes could not be related to signal phasing (in one case the pedestrian scramble was not operating and in the other case, the pedestrian was hit by a vehicle backing up). Also, all of the post-installation injuries were suffered by elderly pedestrians, possibly related to their relative difficulty in adapting to such a change. The differences are substantial enough that it is not necessary to compare to control intersections or annual trends. While there are a number of other pedestrian scramble intersections in San Francisco (particularly on Montgomery Street), these were introduced such a long time ago, that there are no pre-installation crash tabulations available. The total number of vehicle/pedestrian conflicts observed at Stockton Street pedestrian scramble intersections decreased from 7.0% to 1.1%. However, the proportion of pedestrians running or aborting their crossing increased at each intersection, in total from 5.3% to 11.2%. One possible reason is that late in the exclusive pedestrian phase, with no conflicting auto movements and the countdown showing few seconds remaining, many pedestrians are emboldened to cross even though they must run to finish crossing before traffic is released. The northbound impact found by TSC researchers was a reduction in Muni operating speed, including dwell time, from 3.55 MPH to 2.94 MPH (a 21% impact). (See Figure 4.3-2.) The actual impact on running time in the five blocks between Broadway and Sacramento was an average of 55 additional seconds. There was a high level of variability in Muni travel times, with a standard deviation of 69 seconds and an average 5:51 travel time (coefficient of variation, or standard deviation as a proportion of the mean, was 0.20 for southbound PM peak between Broadway and Sacramento) and 41 seconds standard deviation for northbound PM peak. Mean boarding times on Stockton during the PM peak ranged between 38 and 51 seconds at each stop location (this included only time that the bus was actually stopped, not acceleration/deceleration delay). The standard deviation was 13 to 16 seconds for four of the five stops, but 24 seconds for the Jackson/Washington northbound stop. Total Muni signal delay averaged 88.6 seconds southbound and 85.7 seconds northbound per bus. This compares to the worst-case scenario of waiting through every red phase of about 220 seconds (which is the sum of the red phases at each intersection). Auto speeds for through vehicles on Stockton Street decreased significantly after the installation of the pedestrian scramble, from 6.8 MPH to 3.8 MPH (44%) northbound and from 8.2 to 4.9 MPH (40%) southbound. These estimates were determined by floating car speed runs. Auto speeds on the side streets were found to improve with the pedestrian scramble. This could be because prior to the installation, heavy vehicle turns from the side streets (often effectively with one lane approaches) were delayed by pedestrians crossing Stockton Street, delaying all vehicles on the approach. As expected, the pedestrian scramble brought a major reduction in vehicle delays caused by conflicts between turning vehicles and pedestrians. The number of turning vehicles delayed by pedestrians decreased by an unweighted average of 79% at the four intersections (up to 88%). The actual vehicle-seconds of delay caused by pedestrians decreased substantially to nearly zero. Computerized traffic modeling using the Synchro ™ software package was conducted to analyze the effects of signal timing on vehicle progression. The results indicated that offsets were not well timed for a steady 25 MPH progression. However, field observations suggest that it is quite difficult to model or optimize traffic flows during peak activity periods because there is so much friction from double parkers, parking maneuvers, bus maneuvers, and jaywalkers (plus a very distracting visual environment). Speeds are extremely variable. San Francisco has been a national leader in the use of pedestrian countdown signals, converting virtually all of the pedestrian signals citywide (over 800 intersections) to the countdown version This was completed outside of the FHWA PedSafe project, and the results of the conversion were reported separately and in greater detail15 Pedestrian countdown signals have been proposed as the standard form of the device for revisions to the Manual on Uniform Traffic Control Devices expected in 2009. During the 14-intersection pilot project, pedestrian injuries decreased by about half at intersections equipped with countdown signals. However, this decline was not statistically significantly greater than the decline at control intersections not receiving countdown signals. This likely reflects some regression to the mean. In general, when countdown signals were installed, both during the pilot installation phase, and during the later citywide installation, signal timing was also changed. Previously, the San Francisco practice was to carry the flashing Red Hand (flashing Don’t Walk) pedestrian phase through the yellow traffic indication phase. The solid Red Hand (solid Don’t Walk) started concurrently with the start of the red traffic indication. With the countdown signal installation, this changed so that the solid Red Hand began at the beginning of the yellow phase, more consistent with the signal practice of other cities in Northern California. At 579 intersections converted from conventional to countdown pedestrian signals, the number of pedestrian injury collisions decreased by 22%. During the same period, at 204 other signalized intersections without countdown signals, the decline was only 2%. The proportion of all traffic collisions attributed to red light running decreased from 45% to 34%. While there were numerous factors affecting the decline in the number of drivers running red lights, it is likely that the countdown devices played a major role by providing warning to drivers approaching a green light about to change. In-pavement crosswalk lights were installed at four locations in San Francisco: three by the city and county (DPT) in 2001 and the first by a private school (in Spring 2000). Three of these locations were mid-block (two connecting school facilities on either side of local streets with minimal non-student use, the other connecting City Hall with a civic plaza across a four-lane collector street with much heavier and more diverse pedestrian volume). The fourth was at an uncontrolled crosswalk at a T-intersection on a four-lane arterial in a neighborhood commercial district and this installation was later replaced by flashing beacons. There were no clear impacts of the in-pavement lights on reported pedestrian collisions. At the City Hall location, on Polk Street mid-block between Grove and McAllister Streets (a LightGuard site), there were no pedestrian injuries reported five years before or five years after installation. At the other LightGuard site (Page Street, mid-block between Ashbury and Masonic Streets), there was one reported pedestrian injury in each of the five years before and after installation. At the Francisco Street location, there were no pedestrian injury collisions prior to installation versus two injury collisions after the installation. However, one of the post-installation collisions was not preventable by the device, as it involved a vehicle backing up. At the Mission & Santa Rosa intersection, pedestrian injury collisions increased from two to five after installation. However, the in-pavement lights were either malfunctioning or removed during much of the five-year post-installation period, so no conclusions could be drawn. At the two infrared bollard locations, 91-94% of pedestrians were detected correctly, and only 2-9% of activations were false. By contrast, at one microwave pedestrian detection location, only 71-86% of pedestrians were detected correctly, and 24% of activations were false. For the combined microwave pedestrian detection data (at the two installations), the number of drivers stopping for pedestrians increased from 53% before installation to 72% after installation. 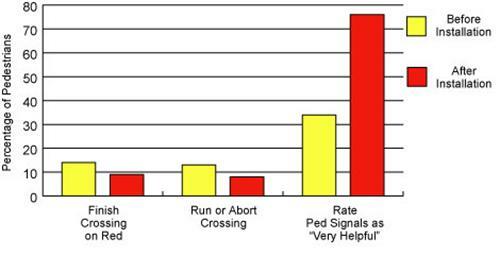 The percentage of pedestrians running to complete or aborting their crossing actually increased from 2% to 5%. At the City Hall infrared bollard installation, the proportion of drivers stopping for pedestrians, increased from 67% to 82%. 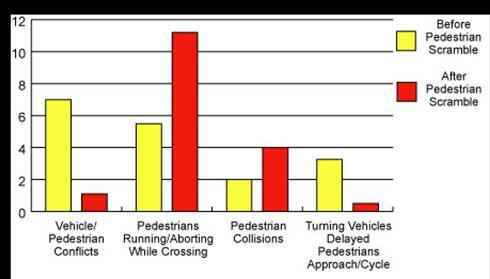 The percentage of pedestrians running to complete or aborting their crossing was reduced from 6% to 3%. At the same location, pedestrian intercept interviews were conducted. Of those aware of the lights, 50% deemed them to be “very helpful” in helping them to cross safely. 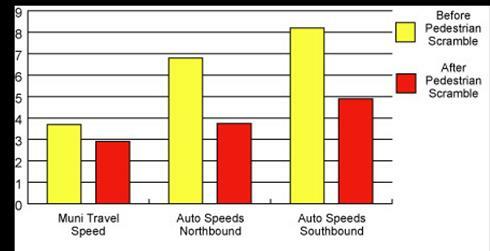 Also, 73% believed drivers were yielding more frequently. Modern accessible pedestrian signals (APS) provide an audible and vibrotactile indication of the Walk signal to the blind and visually impaired. They also can provide audible and Braille information about the intersection name and crosswalk orientation. San Francisco has installed APS devices at 52 intersections. 14 Zegeer, C.V. and C. Seiderman. “Designing for Pedestrians.” In 2001 Compendium of Technical Papers, ITE, 71st Annual Meeting, Chicago, IL Washington, DC: ITE, 2001. Zegeer, C.V. et al. Pedestrian Signalization Alternatives. Report No. FHWA/RD-83/102, Federal Highway Administration, Washington, DC, 1983. 15Markowitz, F., Sciortino, S, Fleck, J. and B. Yee. “Pedestrian Countdown Signals: Experience with an Extensive Pilot Installation.” ITE Journal, vol. 76, no. 1 (January 2006): 43-48. 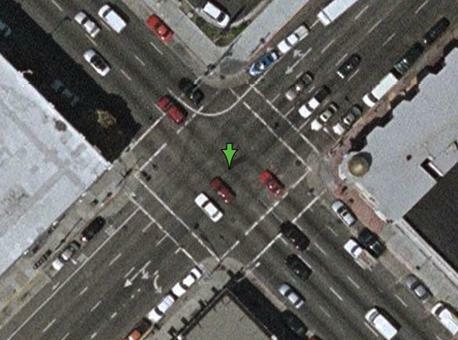 Fielding, S. Pedestrian Countdown Signals: Evaluation of Citywide Installation in San Francisco. Pro Walk Pro Bike Presentation, Madison, WI, September 5, 2006.